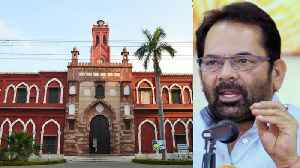 Uttar Pradesh chief minister Yogi Adityanath on Thursday again raised the issue of the “minority” status to Aligarh Muslim University (AMU) saying that the institution is not a minority one and,..
▶ Videos for "Aligarh Muslim University"
Minority Affairs Minister Mukhtar Abbas Naqvi on Tuesday said that the Aligarh Muslim University (AMU) incident where three students were booked on sedition charges for allegedly for raising..
Lucknow (Uttar Pradesh), Oct 16 (ANI): All India Muslim Personal Law Board (AIMPLB) member and advocate Zafaryab Jilani responds to the brimming issue of Aligarh Muslim University (AMU) where 1200..
New Delhi, Oct 16 (ANI): Minority Affairs Minister Mukhtar Abbas Naqvi on Tuesday said that the Aligarh Muslim University (AMU) incident where three students were booked on sedition charges for..
JNU is continuously running on the lines of AMU. In the first AMU, nationwide slogans were slaughtered and now 1200 Kashmiri students have threatened to leave AMU. 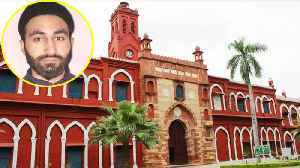 Former Vice-President of the AMU..
Students of JNU have often seen slogans of anti-independence freedom, but this time the video of anti-independence slogan has become viral, it is from Aligarh Muslim University. 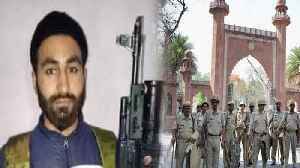 In this video, Kashmiri..
Indian Army killed Manan Wani After the news of Mannan Wani being killed, about 15 students gathered at Kennedy Hall of Aligarh Muslim University. They started reading namaz for Wani here. At the same.. The police have dropped sedition charges slapped against 14 Aligarh Muslim University after the recent protests on the campus, citing "lack of evidence". The students were booked for sedition after..
Another Kashmiri student, after his alleged objectionable tweet in connection with the Pulwama attack, has been suspended from the Aligarh Muslim University (AMU). The Aligarh police is likely to drop the “sedition” charges against 14 students of Aligarh Muslim University (AMU) on “technical grounds”, even as it identified 17 students who were allegedly.. The Uttar Pradesh police had booked 14 AMU students for sedition on Tuesday following a complaint filed by a local leader of BJP. Aligarh Muslim University (AMU) spokesperson Omar Peerzada said that the matter is being further probed and "strong deterrent action" will be taken once the investigation is complete. Fourteen students of the Aligarh Muslim University (AMU) were charged with sedition on Wednesday after violent protests took place on the university campus following reports that AIMIM leader Asaduddin..
Fourteen Aligarh Muslim University students, including their union chief, were booked under sedition charges after protests on the campus following reports of a planned visit by AIMIM lawmaker..
As many as 12 students, including the university's students' union chief, were booked under sedition charges after a complaint of alleged assault was filed by an ABVP member. Following this a "boycott..
Security has been beefed up at the Aligarh Muslim University (AMU) after some students and a TV channel crew got into an altercation over reports of a visit by AIMIM MP Asaduddin Owaisi, police said.. The youth wing of the BJP is now pressing for a temple in the premises of the Aligarh Muslim University (AMU) in Uttar Pradesh for Hindu community students studying there . The day honours the date on which the Constitution of India came into effect.The day honours the date on which the Constitution of India came into effect. Speaking to ANI, the Public Relation Officer (PRO) Omar Peerzada asserted that the university has a code of conduct and violation of it will result in action. The university asked the students to explain their actions. A controversy erupted in the Aligarh Muslim University on Monday after a group of vegetarian students alleged that they were served food cooked in oil used to prepare non-vegetarian dishes, a charge..
As some Muslim leaders have sought Supreme Court's intervention to monitor Dharam Sabha held by the Vishva Hindu Parishad (VHP) for the construction of Ram temple in Ayodhya on Sunday, Bahujan Samaj.. 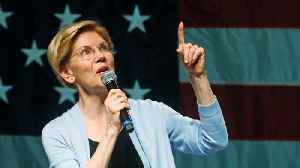 Ahead of Lok Sabha elections, politics is arising over the usage of educational institutions for political functions in Varanasi, Uttar Pradesh. The Congress alleged that the Bhartiya Janata Party..
Bharatiya Janata Party (BJP) Member of Parliament (MP), Satish Kumar Gautam has stated that Aligarh Muslim University (AMU) is being run on Taliban ideology. Aligarh MP, Satish Gautam has written a letter to the vice chancellor of Aligarh Muslim University accusing that the institution is being run with a "Taliban Mentality" and is a "seminary for..
After the voting is held, the counting will be done on the same day and the results will be declared. Addressing a meeting of the Aligarh Muslim University Old Boys’ Association here, Azad said India stands divided in present times and he himself is having a first-hand experience as most Hindu..
Azad reportedly made the comments at an event of the Aligarh Muslim University (AMU) in Lucknow on Wednesday, apparently to criticise the political climate under the Bharatiya Janata Party (BJP)-led..
Kashmiri students at the Aligarh Muslim University have deferred their decision to surrender their degrees and leave the campus en masse following revocation of the suspension order of the two students..
Kashmiri students at the Aligarh Muslim University (AMU) have deferred their decision to surrender their degrees and leave the campus. Aligarh Muslim University (AMU) Vice-chancellor Tariq Mansoor on Tuesday clarified that the university administration has not slapped sedition charges against any Kashmiri student. This came following.. Terrorists on Monday hurled a rifle grenade on camp of 183 battalion of Central Reserve Police Force (CRPF) in Newa. One CRPF personnel injured, cordon & search operation launched in the.. The National Conference (NC) on Monday expressed concern over the alleged harassment of Kashmiri students studying in the Aligarh Muslim University (AMU) and other educational institutions outside the.. The PDP president said this while demanding withdrawal of cases against three Aligarh Muslim University (AMU) students from the Valley who were booked after they allegedly tried to hold a prayer..
Gloves are off between two former allies after senior BJP leader and former Deputy Chief Minister Kavinder Gupta demanded a probe against former J&K Chief Minister Mehbooba Mufti for her remarks over.. The three Kashmiri students of the Aligarh Muslim University (AMU) were booked Friday for sedition for allegedly raising "anti-India" slogans and trying to hold a prayer meeting for Wani, a day after..
Kashmiri students studying at the Aligarh Muslim University organised a protest march on the campus Monday against slapping of sedition charges on their three peers and alleged harassment by local..
Langate MLA Sheikh Abdul Rasheed was detained Sunday for taking out a protest march here in "solidarity" with Kashmiri students of the Aligarh Muslim University (AMU)who were booked on sedition..
Three Kashmiri students of the Aligarh Muslim University have been booked for sedition for allegedly raising "anti-India" slogans and trying to hold a prayer meeting for Hizbul Mujahideen.. The Bhartiya Janata Party (BJP) Member of Parliament from Aligarh, Satish Kumar Gautam on Friday wrote a letter to the Vice Chancellor (VC) of Aligarh Muslim University (AMU) after some students of the..